Replacement teeth supported by dental implants function so well and last so long because, like natural teeth, they are securely anchored in the jawbone for maximum support. In order to benefit from this remarkable technology, however, you need to have enough tooth-supporting bone in your jaw to hold a dental implant in place. Unfortunately, after tooth loss, the surrounding bone almost always deteriorates — decreasing in width, height, and density — and this process starts immediately. The longer a tooth has been missing, the more the bone that used to surround it resorbs (melts away). If you want a dental implant but don't have enough bone to support it, can anything be done? Yes. 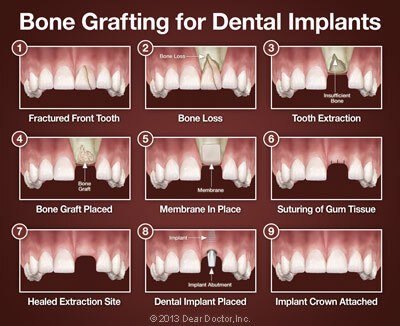 Very often you can still get the replacement tooth you want, thanks to routine bone grafting procedures. The maxillary sinuses are behind your cheeks and above the upper teeth. Sinuses are empty space that has air in them. Some of the roots your upper teeth extend up into the maxillary sinuses. If an infection develops in a tooth, it can subsequently work into the maxillary sinus. When these upper teeth are then removed, there is bone loss and hopefully some bone separating the maxillary sinus and the mouth. The longer you go without teeth there, the more bone is lost. If you wear a denture or partial denture that accelerates the loss of bone. See the Story of Progressive Bone Loss under Patient Information. Dental implants need bone to hold them in place, and they, in turn, stimulate the bone so is remains stable. When the sinus wall is very thin, it is impossible to predictably place dental implants in this bone. Note, the floor of the sinus is the roof of the upper jaw. Dr. Miles enters the sinus from where the upper teeth used to be. The sinus membrane is then lifted upward and donor's bone is inserted into the floor of the sinus. With the technique illustrated above, there is enough bone that the teeth can be removed, the bone placed as well as the implants, all in one procedure. After several months of healing, the bone becomes part of the patient’s jaw, turning into new bone, and supporting the dental implants and the forces on the new teeth. When there is little bone below the sinus to hold the dental implants, a 2 stage procedure is needed. At the first procedure, the bone is added to the sinus and allowed to integrate and be replaced by new bone for 6-9 months. After that time of bone replacement, the implants are placed. The dental implants are then inserted and stabilized in this new sinus bone. More time is allowed to pass for the bone to grow tightly around the dental implants, often 4-6 months. The dental implants are then tested for stability to assure that they will be strong so you can chew whatever you want. The sinus bone regeneration makes it possible for many patients to have dental implants when years ago there was no other option other than wearing loose dentures. With some of the newer techniques we use, this is one of many choices that we consider when deciding what will give you the most predictable result and what alternative treatment we could consider that may be adequate. Guided tissue regeneration is a periodontal surgical procedure that use barrier membranes in conjunction with bone grafts and growth factors such as Emdogain to direct the growth of new bone and gingival tissue at sites with insufficient volumes or dimensions of bone or gingiva for proper function, esthetics or prosthetic restoration. 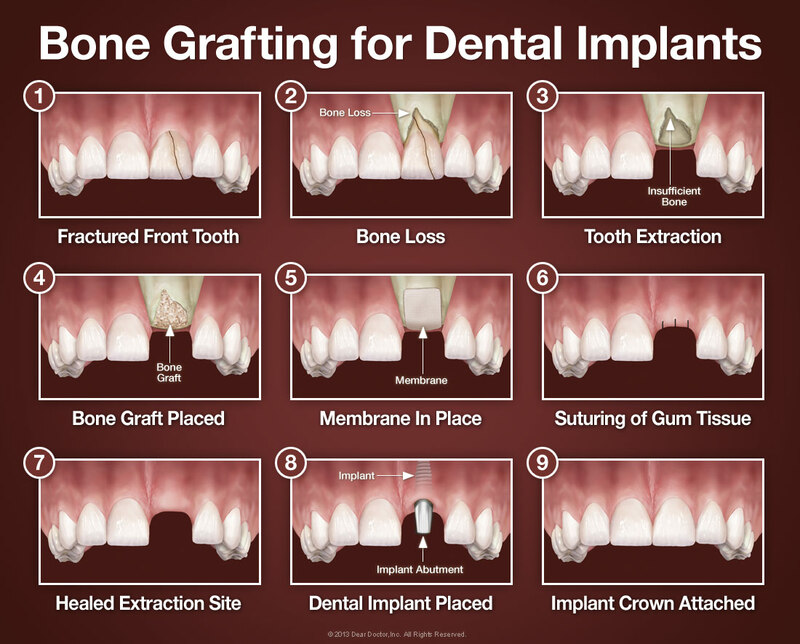 The procedure for placing a bone graft usually requires only local anesthesia, through oral or IV sedatives can also be used to achieve a higher state of relaxation. Because a small incision in your gum tissue needs to be made to access the underlying bone that will receive the graft, you may experience some soreness in the area after the surgery; this can usually be managed by over-the-counter anti-inflammatory medication and/or pain relievers as well as ice therapy after the procedure. Though you will soon feel completely back to normal, it may take your body up to seven months for bone maturation to take place to receive your dental implant. The waiting time allows the healing process enough time to achieve the desired result: ideal support for replacement teeth that look great and will last a lifetime.